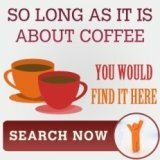 There are so many types of coffee brewing equipment out there, which are being used to enjoy gourmet coffee. These types of equipment include the percolator, French Press, cold brew coffee maker, and the vacuum coffee maker. 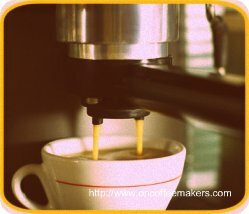 So, you would be surprised that although most of us would either use an espresso machine or an automatic drip coffee maker to make our coffee, there are plenty of choices out there to make a great coffee. The percolator is probably one of the oldest types of coffee brewing equipment that is still being used today. There are two types of percolators: the stove top percolator, and the electric percolator. These are essentially the same, the only difference being an electric percolator is able to generate its own heat without an external heat source, while the stove top percolator must be placed over the stove to make coffee. Inside, the percolator has two chambers. The upper chamber is essentially the filter basket, where you put the coffee grounds. The lower chamber is the water chamber, which you fill up with water. The upper and lower chambers are connected by a tube that runs along the center. As the water in the lower chamber heats up, it rises up and flows through the tube into the upper chamber, where it mixes with the coffee grounds, and the hot liquid trickles back down into the lower chamber. This process is repeated again and again and in effect, the coffee gets stronger. The length of time this process goes on influences how strong the coffee is going to be. Percolators usually have a transparent cupola or viewing window on the lid to allow the user to judge the strength of the coffee by watching the whole perking process. you to heat up water separately before you pour it into the press pot. However, there are electric press pots in the market that heat up the water automatically for you, thereby eliminating the need to heat up water separately and transferring it into the press pot. Basically, the French Press is a small glass coffee pot fitted with a plunger that has a filter plate. To make pressed coffee, put some coarsely ground coffee grounds in the bottom of the pot, fill it up with hot water, let the water and coffee grounds mix for a few minutes while stirring, cover the pot with the lid, and push the plunger down. The filter plate, which is attached to the plunger, traps the coffee grounds at the bottom of the pot and effectively separates the coffee grounds from the coffee, allowing you to serve and enjoy the pressed coffee without worrying about the coffee grounds ending up in your cup. The vacuum coffee maker is a fascinating device that produces an exceptionally clear brew. At first glance, it looks more like a laboratory apparatus than a coffee maker. 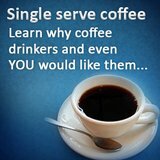 However, don’t let its looks fool you, since it is known to make great tasting coffee. 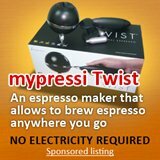 This bizarre-looking coffee maker requires the use of an external heat source to brew coffee. A vacuum coffee maker is almost made entirely of glass, and consists of two main parts: an upper and lower chamber. The upper and lower chambers are connected with a tube that contains a filter and attached to the upper chamber, and this connection is completely sealed with a rubber stopper to prevent leaks. To brew coffee using a vacuum coffee maker, put coffee grounds inside the upper chamber and water inside the lower chamber. Place the apparatus over a heat source, such as a stove. As the water in the lower chamber heats up and reaches boiling point, some of it is converted into water vapor. Since water vapor takes up more space than water in its natural, liquid state, it causes pressure to build up inside the lower chamber, and forces the hot water to rise up into the upper chamber. Once the hot water reaches the upper chamber, it mixes with the coffee grounds, and the coffee extraction process begins. The length of time you allow the hot water and coffee grounds to mix influences how strong the coffee will be in the end. Remove the apparatus from the stove and let it rest on a cool surface. As the lower chamber cools down, it creates a vacuum, which forces the coffee in the upper chamber to flow down into the lower chamber. Since there is a filter inside the tube that connects the upper and lower chambers, the used coffee grounds remain inside the upper chamber. To serve coffee, just detach the lower chamber from the upper chamber, and you can use the lower chamber as a coffee pot. If you’re wondering if it’s possible to consume coffee even if you have acid reflux and if there’s a way to make cold-based coffee drinks at home, yes you can, by using the cold brew method to make coffee. The cold brew method can be performed in a number of ways, since the principle behind it is quite simple. To do it, simply soak coffee grounds in cold water in a container for 12 hours. Once that time has elapsed, filter the mixture to remove the coffee grounds. Once the coffee grounds are all filtered out, what you’re left with is coffee extract, which is smoother and is significantly less acidic than coffee brewed with hot water. Now you can dilute the coffee extract with either hot water or ice, depending if you want to make hot or cold-based coffee. To make the process simpler, you can make use of T-Sacs, which are basically large tea bags. Fill those up with coffee grounds, and soak those in cold water for 12 hours. Making use of T-Sacs eliminates the tedious task of filtering the mixture to remove the coffee grounds after soaking. Alternatively, you can use a cold brew coffee maker called the Hourglass Cold Brew Coffee Maker, which also eliminates the manual task of filtering out the coffee grounds and even allows you to reuse your coffee grounds if you immediately refill it with cold water after you have poured out your first batch of coffee extract. These other types of coffee brewing equipment might require a bit more attention and effort to use compared to the automatic drip coffee maker, but you’d be surprised at the quality of coffee that they can make. 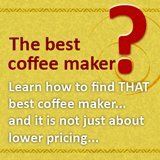 Try using your favorite blend of coffee beans from your favorite coffee roaster and make coffee using one of the other types of coffee brewing equipment listed above. For instance, if you love brewing fair trade coffee from Green Mountain Coffee Roasters with your coffee maker at home, try it with a French Press. It may require a couple of tries before you get the whole preparation process down, but once you do, chances are, you might prefer using the French Press brewing equipment instead of your old coffee maker.